Freshly Made Sketches: Winners For Sketch 329! The Clean Team has chosen the Princesses for you this week and our hostess Kim has chosen the Queen! It is such a thrill to browse the gallery every single week. I never fail to get inspiration and ideas. I am amazed at the incredible variety of cards that come out of a single sketch. This week, Sandra Jayne's card stood out for me. The brilliantly colored butterfly on the white background with the lovely blue and pops of black - such a wonderful combination!! I love the simple twine so that the butterfly stays the focus. Congratulations, Sandra, you are our Queen of Clean! Please come back tomorrow for a new sketch from Jen Brum! Beautiful! Congrats to all on these sweet cards. Congrats to Sandra and all the other ladies! 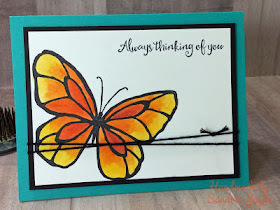 Thank you for picking my card as one of the highlights among the other beautiful cards! Thanks so much! I am honored for sure! Today is my birthday, so being the Queen is even more special! Congrats to all the other chosen cards!! Yay! Thanks for the shout out...love all the gorgeous inspiration! Thank you so much! My niece loved the card... all due to your inspiration!